Cleveland, OH April 8, 2019 — Cleveland Whiskey recently was awarded a gold medal at the 2019 Distilled Spirit and Cocktail Competition at the Del Mar Fairgrounds in Del Mar, California. The San Diego County Fair, presented by Albertsons / VONS, hosts one of the best spirit competitions in the country. With 163 entries from 58 distilleries in this year’s competition, there was no shortage of show-stopping spirits from around the globe. Judging happened February 16 and 17, and 137 medals were awarded (gold, silver and bronze). The Best of Show award will be announced on June 22 at the Distilled Spirit and Cocktail Festival, happening at the 2019 San Diego County Fair. 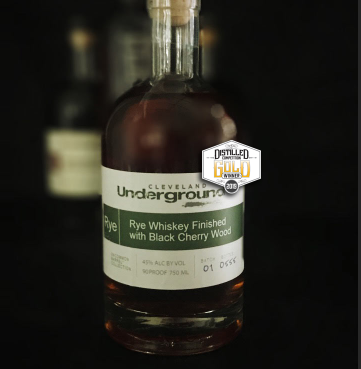 Cleveland Whiskey was awarded a gold in the American Whiskey – Rye spirit style category for its Underground Rye Whiskey finished with Black Cherry Wood, a rye whiskey with a traditional rye spiciness up front with notes of vanilla and butterscotch on the nose. The flavor starts somewhat soft and sweet with mellow oak giving way to creamy vanilla and butterscotch, with undertones of baking spice and a candy-like, fruit forward finish. Cleveland Whiskey is in Cleveland, OH and specializes in whiskeys, including bourbon and rye, aged with a proprietary Pressure Aging technology. Visit www.distilledsandiego.com for full results. WHERE: Del Mar Fairgrounds, 2260 Jimmy Durante Blvd., Del Mar, Calif. COST: Purchase tickets between March 16 and April 5 and save $10 off VIP Lounge and general admission tickets through Ticketmaster. VIP Lounge Tasting: You’ll get a souvenir glass with unlimited samplings of spirits and signature cocktails, access to the VIP lounge/patio featuring gourmet food stations with unlimited grazing, and admission to the Fair for $130 ($120 if you purchase by April 5). General Admission: You’ll get a 10-tab wristband (each tab is for ¼-oz. pours of distilled spirits, and 1 oz. pours of mixed cocktails), plus Fair admission for $35 ($25 if you purchase by April 5). The annual festival is produced by the 22nd District Agricultural Association in conjunction with the San Diego County Fair presented by Albertsons|Vons. Award winners will be featured in the Distilled – San Diego Spirit and Cocktail Festival on June 22, during the fair. The festival celebrates quality spirits and craft cocktails from around the globe. The San Diego County Fair is the largest annual event in San Diego County, and one of the top five fairs in the United States and Canada, drawing approximately 1.6 million visitors annually. we’ve purposely taken a path which embraces positive and radical change. We don’t compromise on quality, but we continually search for improved applications of technology and discard practices which exist simply because they’ve “always been done that way”. Although we’ve already earned over 60 medals and awards in competitions around the world, the ones we’re most proud of were “Whiskey Distillery Innovator of the Year” in 2016, “USA Distillery of the Year” in 2018 from the Berlin International Spirits Competition and Double Gold in 2016 from San Francisco International Spirits Competition.